Laura Klaiber loves science and the outdoors. 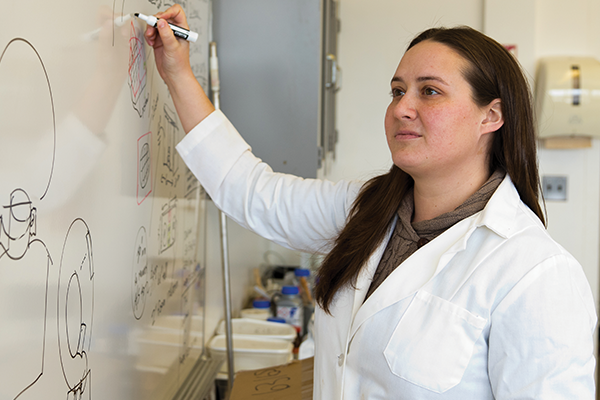 The combination of the two things is the basis for her job as a research scientist at Miner Institute in Chazy. Her focus, nutrient management, is a way to manage nutrients applied to farm fields to optimize yields and growth, while minimizing negative effects on the environment. Klaiber grew up just outside Queensbury, New York and said that being outside was how her family spent time together. They enjoyed hiking, swimming in the brook on their property and cross-country skiing, which Klaiber began when she was two years old. Klaiber’s introduction to Miner Institute came during her time as an undergraduate studying ecology. She participated in the Applied Environmental Science program — a collaborative effort between Miner Institute and SUNY Plattsburgh where a suite of courses is taught at Miner each fall utilizing the vast resources in and around the Institute. Although she had no previous agriculture experience, Klaiber loved animals — she even considered becoming a veterinarian when she was young — and jumped at the opportunity to take a job as a research technician at Miner Institute in 2008. “The opportunity to work with animals was something I was excited about,” Klaiber said. Initially, she worked primarily on dairy nutrition research projects but then became involved with water quality research when the nutrient management research program was initiated in 2009 by Dr. Eric Young. Two of the first projects that Klaiber worked on that sparked her passion were one that evaluated the impact of drainage water management on tile-drained fields and another utilizing a nitrogen management modeling tool (Adapt-N) developed by scientists at Cornell University. In 2013, Klaiber decided to go to graduate school and earn a Master’s degree in plant and soil science. For the next three years she was a Graduate Research Assistant at Miner Institute, working toward her degree at the University of Vermont, while conducting research at the Chazy facility. Her thesis research compared water and nutrient losses from experimental field plots that were tile-drained versus naturally drained. “My research focuses on the interactions between the soil and water that occur in agricultural fields,” Klaiber explained. “We also work to identify and implement practices that minimize erosion and nutrient losses while still producing high quality crops. An important aspect of this is developing a better understanding of how to effectively and efficiently improve the overall health of our soils and make them more resilient to our changing climate which will, in turn, help reduce potential impacts on the environment,” Klaiber detailed. Water quality in local waterways, particularly in Lake Champlain, is an issue that impacts our region both economically and environmentally. “We have a unique landscape and climate in the Lake Champlain Basin and in order to identify the practices that will work best in our region, we need to understand the underlying mechanisms and variability that exist in these systems,” Klaiber said. Funding for some of the research that Klaiber conducts comes from the Northern New York Agricultural Development Program — a farmer-driven program that provides for projects in Clinton, Essex, Franklin, Jefferson, Lewis, and St. Lawrence Counties. There are nearly 100 farmers from all sectors of Northern New York agriculture that identify research projects to fund that will benefit farms and agricultural businesses in the region. The program is supported by the State Senate and funds are administered through the New York State Department of Agriculture and Markets. “Laura’s research on tile drainage and water quality addresses a high priority issue for farmers, legislators and society in general. Her work epitomizes the Institute’s mission to carry on William Miner’s vision of science in the service of agriculture,” said Dr. Rick Grant, president of Miner Institute. Although Klaiber has a 10-year tenure with Miner Institute and has managed field trials, presented her research findings at professional meetings and was an adjunct faculty lecturer for SUNY Plattsburgh’s Introduction to Soil Science course last fall, she is new in her current role at the Institute. She started in January of this year and will oversee a number of water quality and nutrient management projects underway while also taking classes at the University of Vermont to earn her Ph.D. in plant and soil science. Additionally, Klaiber will help train undergraduate students who participate in Miner Institute’s undergraduate education programs, as well as graduate students, interns and new research staff. She is pleased that her work has an impact on the environment of the North Country and Northern New York and she finds it meaningful to engage with students who want to become involved in the environmental sciences. “There are few things more important to society than clean water and nutritious food and I am excited to be a part of a research program whose mission is to ensure the continued availability of these resources by enhancing the environmental and economic sustainability of agriculture,” Klaiber concluded.